How can I generate tag from other tag? Home > How to use tips > How can I generate tag from other tag? 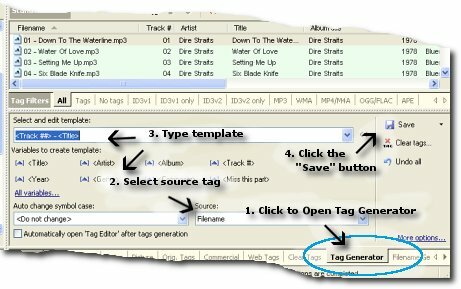 Mp3 Tag Assistant Professional have special feature "Tag to Tag Generator". You can copy the some parts from one tag to other tags. For example, you can copy "Dire Straits" to tag "Artist" and "Down To The Waterline" to "Title" if tag "Comment" = "Dire Straits (Down To The Waterline)". Using template "<Artist> (<Title>)" for it. Click on the tab "Tag Generator" or click the "Tag Generator" button on the toolbar for open "Tag Generator" (see Figure 1). Type template. E.g. "<Artist>-<Title>". You can use all audio tags on template. Read more about templates. View full Templates list. Click the "Save" button for tag generation. Hint: you can type the different templates for different audio files and generate all tags at once. Hint: you can use one template for all audio files if they have identical structure of a source tag. You can change symbol case of tags at tag generation. Select necessary variant ("all lowercase", "all capital", "begin with capital", "change the case", "the fisrt letter is capital") on the "Auto change symbol case" combobox. How can I generate filename using tag information? © May 3, 2008 by AssistantTools.com. All rights reserved.